It’s Not a Joke, it’s a Juke! The Murano CrossCabriolet for example, which is a convertible crossover, who would ever think to do that? What is its purpose? Why would something like that exist? I can answer these questions with one word; FUN. The Nissan Juke we recently tested has that fantastic three letter word written all over it. Let’s get the obvious out of the way 1st, the looks. It is, to be honest, a love-it or hate-it kind of car. In my opinion, it’s not particularly pretty, it probably won’t impress the girls, and most people react with “It’s a face only a mother could love” comment. For this particular reason, I really like it! It’s an extremely cool looking car, combining massive wheel arches, and smooth curves with straight lines and sharp angles. The thin, snake-like “headlights”, and I say this because the headlights are actually the round lights on the bumper, which give the car, a cartoonish-like, menacing look; yet, others see it as giving a happy, joyful appearance to the design. 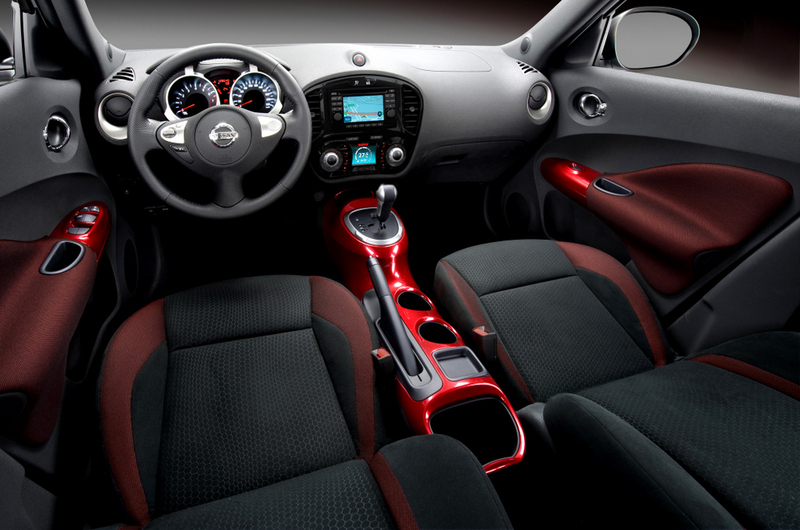 Within the cabin of the Juke, you immediately notice the change of pace. Unlike the polarizing exterior, the interior is quite inviting. The center console and door switch covers are color matched to the exterior paint, giving it a customized look. The gauge cluster has a contemporary and sporty look to it by having the hovering glare shield above the instrument dash. We are happy to report, that the sound system sounds fantastic, and all the controls are uber user-friendly. One of my favorite features is the Integrated Control System or as Nissan calls it, the I-CON. These buttons control the vehicle’s climate control settings and the drive mode, which displays the dynamic driving modes, such as: Eco, Normal, and Sport. Eco mode gives the fuel economy average and trends. Normal mode, displays a torque gauge, and Sport mode displays a boost gauge on the small, center dash screen. This simple, yet genius idea, allows for an uncluttered dashboard and maintain a simple yet usable presentation of the switchgear. We didn’t find any difference in the way the Juke drives in any of the settings even though the Sport setting “tightens up” the response on the steering and throttle. The Juke SL FWD M/T model we tested is equipped with the peppy, 1.6 liter, turbocharged engine, coupled to a deliciously compliant six speed manual transmission. Clutch operation is delightfully smooth, gear shifts are crisp and easy, and torque steer is surprisingly minimal. Handling is predictable and quite pleasant. I honestly had as much fun driving the Juke as I do driving a small sports car. The Juke has enough room for 5 people, with very comfortable driver and front passenger seating, rear seats offer a slight snug space for passengers riding in the back. The cargo area holds 10.5 cubic feet with the rear seat up and 35 Cu/Ft with the rear seat down, which translates to plenty of room for any cargo needs. I imagine this really is a case of don’t judge a book by its cover. 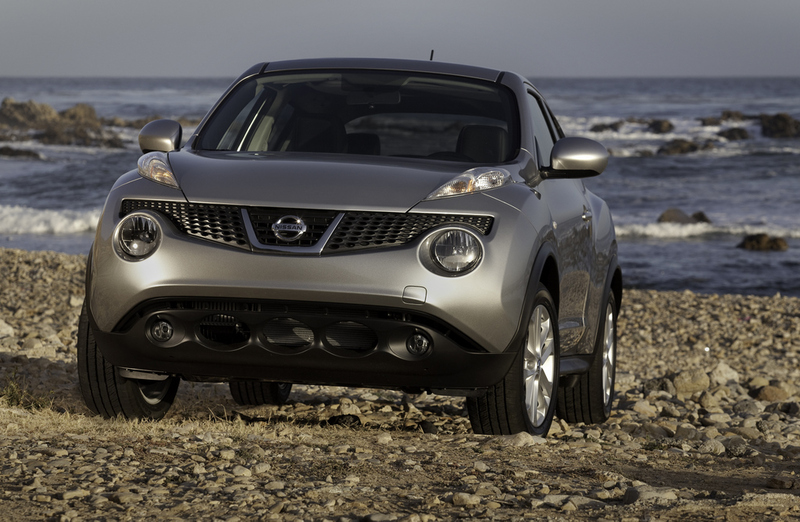 The Juke is a cool, crazy, fun looking car, with a fantastic interior, and a truly great driving experience. I hope Nissan continues with the madness and doesn’t succumb to the bland, boring econo-box standards that some other mainstream brands have fallen victim to. Next time you see a Juke on the road, it’s not a joke, it’s a Juke! ← Grab Some Margaritas, It’s a Fiesta!